Nothing against Austrian wines, but I rarely drink them when I am not working—the restaurant post or slinging Weingut Salomon on the streets of Southern California. If I do, generally, it’s to have a glass of groo-ve (Grüner Veltliner) or Riesling when I’m in a ramen mood, but however much Austrian white wine I may taste, experience tells me it’s best to keep my eyes trained on the less celebrated red wines. As a birthday gift I received a bottle that would help maintain the balance, red versus white. 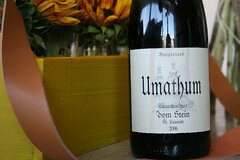 I uncorked the seven-fifty of 2006 Umathum “Vom Stein” St. Laurent with the friend who gave it. A wine that he and his family had enjoyed many times while visiting the estate in Austria. I was unfamiliar with Umathum, the eponymous family that began focusing on wine production in the early 80’s after years of cultivating vines. Under the direction of Josef Umathum, in the mid 80’s, the wines transitioned to organics under the tenets of Biodynamics and their reputation for excellent red wines has been growing ever since. The Vom Stein (from stone) vineyard is an older and warmer site where St. Laurent grows in gravelly soils that are rich in quartz. The wine was vibrant, with developing scents redolent of dried red flowers, dark cherries, blackberries and wet forest floor. Flush medium-body with round, fine tannins, pert acidity and a long, expressive finish of mixed berries, plum, subtle spice, and coffee grounds. St. Laurent is often compared to Pinot Noir, though there is no genetic link between the two red grapes, however this wine shared a lot of the same pleasing flavors while adding a bit of weight to the mid-palate. It was in a class of its own and every sip was better than the one before. The complexity and velvety texture of Umathum’s St. Laurent were eye opening, I couldn’t really tell you if it was a value, because it was a gift (and it’s impossible to find on wine-searcher), but it was certainly delicious. It will definitely make me rethink my Austrian white wine bent, and I will be scouring the wine shops for more of it. Thanks! I bought a couple bottles for holding. Fantastic maker… he makes a very fine Pinot Noir too. I will be on the look out for their Pinot Noir. I am also going to be reviewing Moric red wines soon!